The differentiation of the neuromuscular junction is a multistep process requiring coordinated interactions between nerve terminals and muscle. Although innervation is not needed for muscle production, the formation of nerve-muscle contacts, intramuscular nerve branching, and neuronal survival require reciprocal signals from nerve and muscle to regulate the formation of synapses. Following the production of muscle fibers, clusters of acetylcholine receptors (AChRs) are concentrated in the central regions of the myofibers via a process termed “prepatterning”. The postsynaptic protein MuSK is essential for this process activating possibly its own expression, in addition to the expression of AChR. AChR complexes (aggregated and stabilized by rapsyn) are thus prepatterned independently of neuronal signals in developing myofibers. ACh released by branching motor nerves causes AChR-induced postsynaptic potentials and positively regulates the localization and stabilization of developing synaptic contacts. These “active” contact sites may prevent AChRs clustering in non-contacted regions and counteract the establishment of additional contacts. ACh-induced signals also cause the dispersion of non-synaptic AChR clusters and possibly the removal of excess AChR. A further neuronal factor, agrin, stabilizes the accumulation of AChR at synaptic sites. Agrin released from the branching motor nerve may form a structural link specifically to the ACh-activated endplates, thereby enhancing MuSK kinase activity and AChR accumulation and preventing dispersion of postsynaptic specializations. 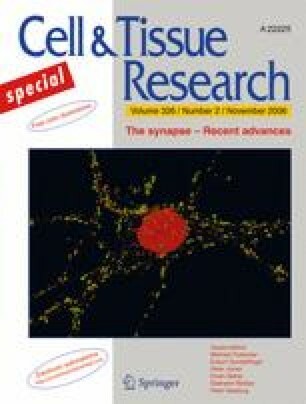 The successful stabilization of prepatterned AChR clusters by agrin and the generation of singly innervated myofibers appear to require AChR-mediated postsynaptic potentials indicating that the differentiation of the nerve terminal proceeds only after postsynaptic specializations have formed. I thank Dr. D.J. Haydon-Wallace for critically reading the manuscript. I also thank Drs. M. Koenen and F. Chevessier for discussions and U. Mersdorf for technical assistance.